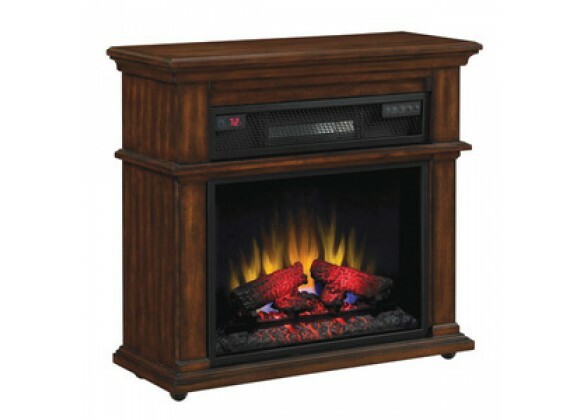 Portable Fireplaces Feature: Casters for easy transportability - 2 locking; Bookmatch veneer with inlaid border; Deeply carved panel with a classic rosette center; Decorative Plynth base and anti-tipping counterweight. Energy Efficient All LED Technology - Plug N?Play From Any Standard 120 Volt Outlet. Casters For Easy Transportability - 2 Are Locking. Flame Brightness Control With 5 Settings. Heater Temperature Setting - Ranges From 60_ to 90_. Timer - 30 Minutes To 9 Hours. Retractable Real Metal Mesh Curtain. Functioning Glass Doors with Center Mount Pull - Glass Stays Cool To The Touch. Thermostat Controls Room Temperature Automatically. 1350 Watt / 4600 BTUs Forced Air Heater.